Our Curly Fox Trotters are wonderful and incredibly rare members of the Missouri Fox Trotter breed. Yes! They are purebred Fox Trotters with the curly gene that originates in the wild mustang herds of Nevada and surrounding states. There are only about 120-130 registered dominant Curly Missouri Fox Trotters in existence. Our well gaited, gentle, intelligent and easy to train horses have been hand picked for their remarkable qualities and their offspring have won over the hearts of their owners and other admirers in many nations. They are sought after, not only in the United States, but also in Europe and Canada. We ship foals and occasionally adults, all over the world. If you have questions about them look through the Frequently Asked Questions below or please contact us! Genuine Curly Horse or Imposter? My heart goes out to the people that contact me unhappy with their purchases from some horse farms who claim to have Curly Horses. For years some breeders have been trying to convince the public that their visibly straight or slightly wavy haired stallions and mares are actual Curly Horses and will produce the visibly curly foals you see here. Their efforts sometimes result in the deception of an unsuspecting buyer. I usually end up hearing their complaints as their new purchase never develops curl or produces the curly foals they were seeking. If you are searching for a visibly curly, Curly Horse you should look for actual visible curls in the ears, fetlocks, mane, body etc. and particularly in the winter, they will be curly all over! We will never try to sell someone a straight or even wavy looking horse and call it the visibly curly type. If you want a genuine visibly curly, Curly Horse, do your homework. Contact the ICHO and/or the ABC and find out their current standard definition of a Curly Horse who carries the dominant curly gene (the one that gives a horse a visibly curly coat for it's whole life.) Also, make sure your new Curly MFT prospect has a full mane and tail as all dominant Curly MFT's have full manes and tails. Know the signs to look for in a recessive vs. dominant curly. On our "about curlies" page it explains everything. If you like the look of a smooth coated horse and want it to be from Curly Horse bloodlines, we often have a variety of that type of Curly Horse called "Smooth Coat Curlies." These usually have the same hypo-allergenic qualities as visibly Curly Horses, but years of breeding them tells us that they do not carry the curly gene that produces visibly curly horses as they do not produce visibly Curly Horses when bred to a straight haired mates. One great thing about them is that you can still have a straight haired horse AND the hypo-allergenic qualities too if you prefer that. Hope this all makes sense! I know it can be very confusing. Please contact me if you have more questions. What is the difference between Dominant and Recessive Curlies? There are two different types of curly coated Fox Trotters in the world that consistently have full curly bodies, manes, etc. and keep these curls for their entire life from birth to death. These are what most breeders describe as Dominant or Recessive Curly Fox Trotters. Recessive Curly Fox Trotters - Ever heard of an unusual looking curly foal that surprises a breeder when two straight haired Fox Trotters are bred together? Many breeders have unfortunately named this odd genetic occurrence the recessive curly gene. It is in no way genetically related to the dominant curly gene and we personally believe it is a genetic defect. This gene lays hidden in the DNA of the best lines of Fox Trotters. Our research shows that Old Fox and his son, Blankenship Diamond as well as his grandson, Golden Governor, are carriers of this gene. All the pedigrees of recessive curlies we have found so far trace back back to Old Fox on both sides of their pedigree. We avoid any bloodlines who are known or suspected carriers of the recessive gene. 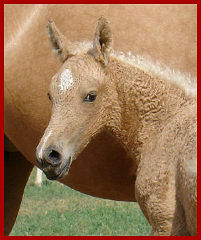 It takes two recessive genes to make this kind of curls present in foals. If two straight haired Fox Trotters that carry this gene are bred together, 25% of the time they will produce one of these foals that have curls on their bodies, sparse manes and tails, potential serious health problems etc. For some reason, these "recessive curly" foals usually shed some or all of their manes and tails in the summer and may have health problems such as the mouth ulcers in the mare shown on the left here. They may also be smaller than regular Fox Trotters and have other negative health issues such as thin hoof walls, slobbering and body hair that falls off easily. 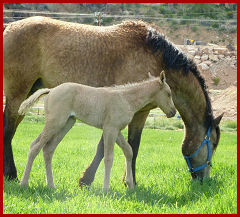 Most people consider this type of horse to be a genetic mishap and used to cull foals when born. 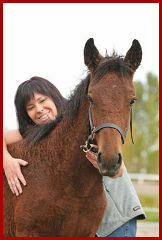 If you can handle the health problems that many have, we have heard that this type of horse is a very sweet companion. This "recessive curly gene" is not the same gene that produces curls on our horses. They are totally different. This is NOT the kind of Curly Fox Trotter that we produce and raise. We don't know anyone who does raise them purposely. world to produce the best Dominant Curly Fox Trotters in existence! Are Curly Fox Trotters really hypo-allergenic? Yes, they are! Our two oldest children are seriously allergic to horses. Every time they would take riding lessons we had to give them medication and even then they would sneeze, get watery eyes and have breathing problems. That's when we found and decided to start raising Curly Fox Trotters. Our allergic children can now ride, groom and love the curly horses with no allergic reactions. We have had many people visit our farm from as far away as Sweden and Germany to see and test our horses for their hypo-allergenic qualities. We are continually amazed and thrilled to see people's reactions to the fact that they have NO allergic reaction to our Curly Horses. I have also talked to many, many people who have had similar experiences. What colors do Curly Missouri Fox Trotters come in? 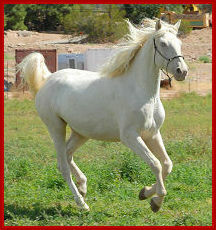 Of these 120 or so horses in the world, most have traditionally been sorrel , sorrel roan and sorrel sabino in color. In recent years, though, breeders have managed to expand the color palate of the Curly Fox Trotters to bay, palomino, black and white tobiano, bay and white tobiano, cremello, blue roan and now buckskin! We intend to add dun to that list!! Where does this curly characteristic in the Fox Trotters come from? Curly horses have existed in the world for hundreds, possibly thousands of years. 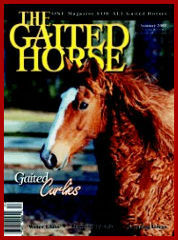 The curly gene in our Fox Trotters traces back to a gaited curly stallion named Curly Jim. 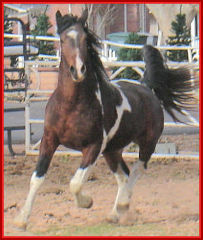 In the 1960's, a select number of Missouri FoxTrotter mares were bred to this stallion. Thankfully, these few curly horses were perpetuated by pioneer breeders in Curly MFT's. There are many theories, but no one is certain of Curly Jim's ancestry. All Zion's Gait Curlies descend from this dominant curly line. Their genetics work just like the cream gene in horses. 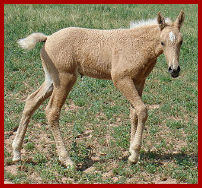 For example, if a horse carries one cream gene, there is a 50% chance that the foal will be cream based (palomino or buckskin.) It's the same with our Curlies. If the horse has one curly gene, it has a 50% chance that the foal will have curls when bred to a straight haired Fox Trotter. What is a homozygous Curly Fox Trotter? Sometimes, the curly sire and curly dam will both give the foal a curly gene. 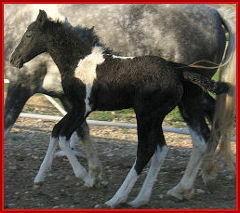 Then the foal will carry two curly genes and is homozygous for curls. These foals who are passed on the curly genes from both of their parents will grow up and ALWAYS produce curly foals, even when bred to a straight horse, because genetically speaking, they have to pass on at least one of those curly genes. Homozygous curlies are extremely rare and are highly prized by breeders because they can guarantee curls for every foal. characteristics, which make it fairly easy to predict whether a horse is likely homozygous. 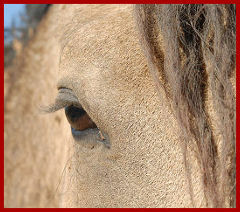 Many breeders use the term "microcurl" to describe the texture of the coat of these horses. 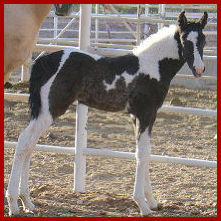 Out of all of the Curlies with the trademark characteristics of being homozygous, none have ever thrown a straight haired foal when bred to straight or curly horses. There are only about 8-9 of these horses with Curly Missouri Fox Trotter breeding in the world today. There are no known homozygous breeding stallions, only mares. What is different about DCC Vegas, DCC Charisma and their offspring? Is it true that curly horses can survive extreme cold conditions? Curly Fox Trotters are not only beautiful, they seem to be hearty and able to survive extreme winter conditions. Their curly coat creates a warm air layer and insulates them from the weather. People claim their curly horses are often found with a crust of snow on their backs, which the curls support, and they are warm and dry under the curls. We live in Southern Utah and have not been able to witness this for ourselves yet, but see below article entitled "The Dameles and the Curly Horse." What is the difference between ICHO and ABC registration? Is it important to have my horse ABC registered? ABC stands for American Baskir Curly. They are the original registrar for all curly horses. We do not actively participate in ABC registration. Several years ago the board of directors for that group decided to close the books on curly horses. This means that only ABC registered horses may be bred with other ABC registered horses in order for the offspring to qualify for ABC papers. Many breeders of Gaited Curlies and Curly Missouri Fox Trotters were not happy with this decision. 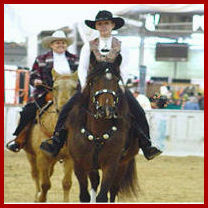 Currently there are only about 400 Gaited Curly Horses in the entire world and of that 400, about 120 of them are MFTHBA registered Curly Missouri Fox Trotters. This would mean that the only way for us to maintain ABC papers would be for us to breed our few horses together indefinitely. If we allowed this to happen, severe inbreeding would result after only a few generations as most of them are related at least distantly. progressive and dedicated members of the curly community. They saw that inbreeding for gaited curlies and many other specialty groups of curlies like curly sport horses, curly ponies and curly draft horses was NOT acceptable. While they have strict specifications for allowing a foal to become ICHO registered, the ICHO allows the specialty breeders to outcross their valuable curly foundation horses with the finest straight haired examples of their particular specialty. This way, World Grand Champions can be added to curly foundation stock to create the highest quality curly horses in the world. Thus, continually improving andstrengthening gaited curly horses for future generations. breeders of Curly Missouri Fox Trotters recognize that the ABC registered Curly Fox Trotters are literally a dying breed. In just a few years they will either be seriously inbred or the last remaining ABC registered Curly MFT's will simply die off. Given these facts, all of our clients have been more than happy to have their Curly Missouri Fox Trotters ICHO and MFTHBA registered. How much do these horses cost? quality horse, but prices for our Fox Trotters are usually similar to other high quality horses. Most are purchased as foals, but occasionally a yearling, two-year old or trained riding horse may be available for purchase. 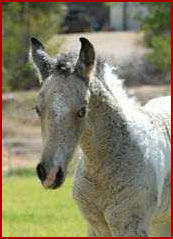 Our straight haired foals (which often have the same hypo-allergenic qualities) generally sell for $1,500 and up. 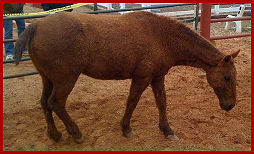 Curly MFT's generally sell for $4,800 and up depending on the bloodlines, training, conformation, gait and color. Here are several links to follow where you can learn more about Curly Fox Trotters on our site. We love talking about these gentle, intelligent and rare horses. Dameles and the Curly Horse"
Many more articles on Curly Horses at Curly Horse Country!!! "Recessive curly" Fox Trotter. We DO NOT raise these.